Why are we your #1 for sports equipment? - Mark Harrod Ltd.
We are proud to say that the majority of the products we supply are made by us right here in the UK. 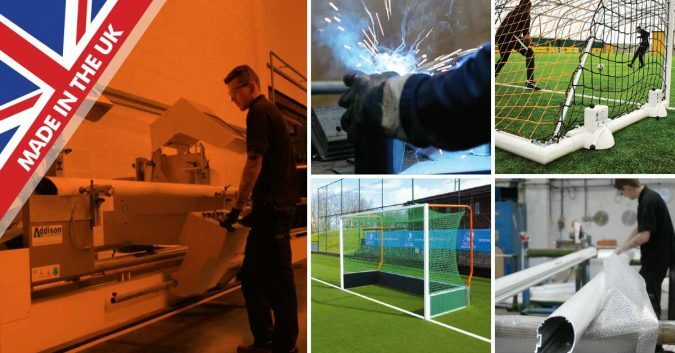 All our metal goals and shelters for football, hockey and rugby are designed and manufactured by the team at our manufacturing base in Staffordshire. We also employ some of the best UK engineering companies to provide items such as cricket cages and fencing. We can’t guarantee everything we supply is sourced from the UK but we do work with some great UK based companies such as Quickplay, Diamond and Samba Sports to provide training equipment and lightweight goals to our customers. We have a small highly skilled team of experts here at Mark Harrod Ltd, meaning we are able to provide a very focused service for your facility. The bulk of our products have been designed and manufactured in-house. There is an expert sales team to advise on what is the right product for you. Our own team will often deliver your equipment and if you have booked installation it will be Mark Harrod Ltd employees who will carry out the project. The same expert team are responsible for repairs, servicing and maintenance. Since our humble beginnings we have been at the forefront of sports equipment innovation. 2004 saw us launch our Easylift goal, which allowed equipment to be pushed and pulled around site after raising the frame above the playing surface. The last few years have seen many new products emerge from our R & D team, from new equipment transport systems to training products through to our revolutionary new multi-directional wheeled goal. We have very strong working relationships with some of the top sports clubs in the country who often have very specific needs and will consult with us on new ideas of how to advance their training programs. The products from these consultations will be designed, manufactured and delivered to an agreed specification and then will often make it onto our ever growing product portfolio. Tailor made nets are very popular, who wouldn’t want their teams’ colours draped over the back of their goals? We have an extensive range of colours and in any combination. Single coloured nets or striped nets custom made in 4mm twine at our Lowestoft net making facility. We believe we have the greatest depth of knowledge of any sales and customer service team within the sports equipment sector. On the end of the phone or just an email away are a team of experts who have a huge range of experience in design, manufacture, delivery and maintenance of sports products. Nobody within this small team has not gained significant experience in other areas of the business. So whoever answers the phone or is on the end of an email will ensure you get the best advice. We may not be the cheapest but we believe we offer the best value. The quality of our UK made products is famous throughout the sector and is often lauded as ‘the best’. There are cheaper products out but at what cost? Is this equipment manufactured in the UK? Can you trust the knowledge of the sales advisors? What is the after sales service like? Can they install your product, if not who will? These are all questions you should consider when purchasing your equipment. We have a number of partnerships in grassroots sport throughout the UK and disability in sport is a cause we consider important. We have a proud connection to the England Amputee Football Association who get the use of our equipment free of charge with two pairs of goalposts donated to the England Amputee training camp by 2019. We have a commitment to the schools and college footballing movement in our partnership with the English Schools’ Football Association to who we supply 7-a-side goals for the ESFA’s national finals every season using our own vans to transport them to prestigious venues. This all at no cost to ESFA. We have supported grassroots clubs and schools’ sports venues in their time of need when equipment has been stolen or vandalised. On numerous occasions new equipment has been delivered or repairs have been carried out without cost to the customer. We are proud to be affiliated with many industry organisations and are members of the Sports and Play Construction Association (SAPCA). As a member of SAPCA we are fully compliant in all aspects of sports equipment quality and service. Membership of this prestigious body requires us to have the financial stability to ensure we can guarantee provision of parts, service and maintenance of our products well into the future. We are on the Football Foundation’s approved supplier list and our dedication to provide great service and quality products has resulted in us being the official goalpost supplier to the English Schools Football Association. Where applicable our goals and equipment apply to the relevant British and European Standards ensuring safety and product quality is maintained to the highest level. Our design team has consulted with the English FA, other manufacturers and industry bodies on what safety requirements are important, how best to implement the strict quality required to meet such exacting standards and ensure sports equipment is not only safe but remains safe into the future. Our steel football goals are either zinc plated or galvanised, meaning we can offer a 3 year guarantee and our goals are less prone to rust.